artsy Amy: Unpack or craft? Scallop Treat Box, originally uploaded by artsy Amy. Midnight crafting rocks now that my digital cutter has finally been unpacked! Hunting through boxes with Jeffy's massive EMS flashlight perched between my chin & chest I could do without. Note to self - find attractive miner headlamp before anyone mentions unpacking boxes again. And guess who was sitting on the couch tonight as I foraged for craft supplies mumbling something about a "dedicated" craft space? Evidently he still doesn't know me. I've created for so many years without a proper craft area I won't know how to function if an expedition for a reliable pair of scissors isn't step one in a project. My IKEA scissors were found in dear Son's room on his wasteland of a desk from a recent 3D poster project at school. I can't do sudoku but I can assemble a ridiculous selection of craft supplies when the mood strikes. 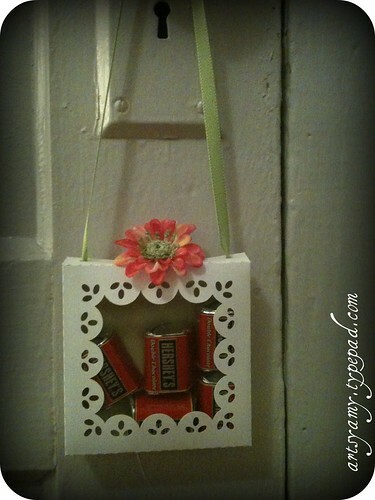 This adorable scallop treat box is filled with Hershey's Double Chocolate Nuggets. It was made from white card stock, plaid scrapbook paper, sage ribbon, fake floral tidbit, and the see through film was cut from a sheet protector. By the way, I made two of these. On the first one I used a Scotch permanent adhesive runner which was so not permanent. Then I re-glued it with an Elmer's Glue stick; epic fail. Finally I broke out the hot glue gun. When in doubt, always use adhesive that can cause burns measured by degree.